This hotel would be an excellent choice for the budget conscious leisure visitor to Prague, looking to stay in the centre of the city. (HO 05.09) The hotel has a modern bright yellow facade. 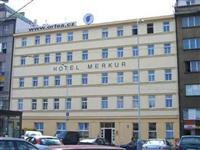 This hotel has an excellent location in central Prague close to the main railway station and the Old Town Square. There are excellent tram and metro connections throughout the city.